Modelling gravity is a lot of fun and a great excuse for a hours PICO-8 programming. 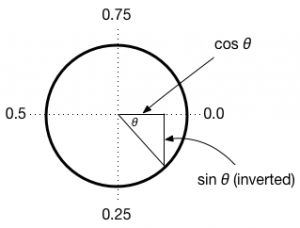 In this post I will take you through a very simple orbit model that uses Newton’s inverse square law of gravitation to model planetary motion. To model this is PICO-8 we need to calculate the distance between two objects. PICO-8 has no built in function to do this, but if you know the coordinates of the two objects, you can use pythagoras to calculate the distance (the hypotenuse) between the two. I add a pythag(a,b) function to my projects to keep things simple. Because pythag() involves squaring the difference in x and y values, it doesn’t matter which way around the sun and p object are. Now we have the distance, we can calculate the force acting on the planet. Note that we make a few assumptions here to keep things easy. First, we assume the planet’s mass is unimportant in comparison to the sun. Secondly we combine G and m1 into a single value of 20. Finally, to get everything working within PICO-8’s 128 pixel square I divide the field strength by 10. Now we have the force we need to break it down into the x and y components. Every update cycle, we move the planet a certain distance in the x and y directions using to velocity vectors vx and vy. To calculate the components for these two vectors, we need the direction of the force and for this we use atan2 which calculates the inverse tangent of the ratio of dx/dy. A full explanation is here. I’ve attached a cart here that adds a little more (including more planets). Download it here: solar v2. I think the inequality in this line should be reversed. Right now, I think the planets pretty much always experience a constant force towards the sun irrespective of the distance. However, when I fix the inequality, the planets seem to prefer very elongated orbits, and stay off screen most of the time. Thanks. I’ve edited the code to take this into account. It required some modification to the size of g for the sun to take into account the inverse square that is now functioning correctly. V2 is now available from the link.